How do you judge a person? You’d say on the basis of behavior, mentality or physical appearance. So, a person may be good or bad. But, is it necessary to judge a person? Can we assume that all people are good at heart? 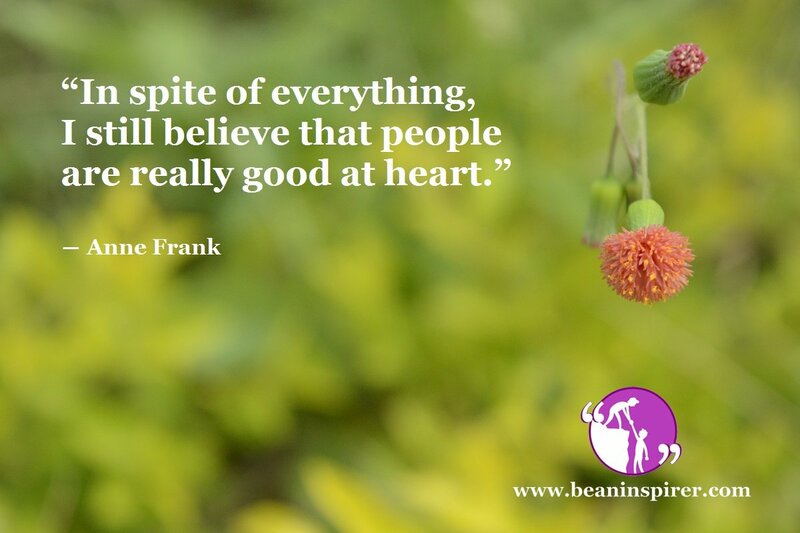 According to Anne Frank, who witnessed the horrors of Holocaust by the Nazis, said that she believes all people are good at heart. You need courage and a kind heart to witness the reality and still trust humanity. Everyone has humanity in them. It’s just that they are lost in the alleys of this complex world. They need to rediscover their positive side and soon they will be back on track. When a child is born, it is unaware of the surroundings. It doesn’t know about the struggles in life, the cruel discrimination on the basis of caste, gender, ethnicity, etc. When a child grows up, it notices the surroundings that inculcate habits and behavior. These habits may be social or anti-social, bad or good. On the basis of these attributes, we judge whether a person is good or bad. So, you see that the person is not bad; it’s about the surroundings that specify the behavior of an individual. When we dissect these attributes, we will realize that no one is bad by choice. Nobody likes to hurt others. Humanity is the only religion and attribute that is known to everybody. That’s why; never judge a person on the basis of behavior. If you find it offensive; help them in realization and contribute towards humanity. Well, it’s not always about the circumstances. For example, I have seen families that are too violent and anti-social but their children are just opposite. How is this possible? When our surroundings affect our behavior and habits, how is this abnormal situation possible? This is because our heart and mind always know the truth. We always have a choice and it depends on upon our preference. Our mind and heart are capable of analyzing the right and the wrong. So we choose our options in life. But still, it doesn’t mean that we are bad. If we can still mend our ways, we can come on the right track. I would like to tell all the readers that positive virtue is always sustainable. Strive for the good and with time, you will reap the results. I must admit that I have learned a lot from the work of Dr. Norman Lewis. The Power of our Subconscious Mind, book by Dr. Murphy helped me significantly in overcoming my tough times. When you have a positive approach or positive thinking, you sow the seeds of optimism in your subconscious mind. Over a period, this seed grows into a fruitful tree. Eventually, you taste the fruit of success. What am I trying to convey? In every circumstance, rough or smooth, always be optimistic. You will easily sail through the rough times. Do not astray from the righteous path. One day, you will become successful and you will be recognized for your good virtue. When you commit a mistake knowingly or unknowingly, you always have a choice. Either you can keep going in that direction or take up the responsibility of improvising yourself. It always better to scrutinize your activities and results. It helps you in determining whether you are going in the right direction or not. Always remember, each one of us has a role in the society. Every individual is responsible for safeguarding humanity. It’s our responsibility of upholding the faith in humanity so that the next generation lives with unity and prosperity in all circumstances. READ ALSO: Why Acceptance is the Right Definition of Being Normal?